I’m going to go ahead and get real with you….I was trying to make lettuce wraps. I bought the filling ingredients (pork and mushrooms were in the grocery ad this week! ), and I thought kale would be the perfect wrapper! I love kale! …kale doesn’t work for a wrap. The center rib is too stiff, and the leaves are just to curly. Hmph. Regardless, the filling below was awesome and no one went hungry! In large skillet, saute 1 pound of mild pork sausage in 1 Tablespoon of sesame oil (or whatever you have on hand). Once browned, remove meat to paper towel, reserving drippings. Once mushrooms have softened (five minutes), stir in 1/2 cup of dry sherry. Cook until liquid is absorbed and alcohol smell is gone (2-3 minutes). 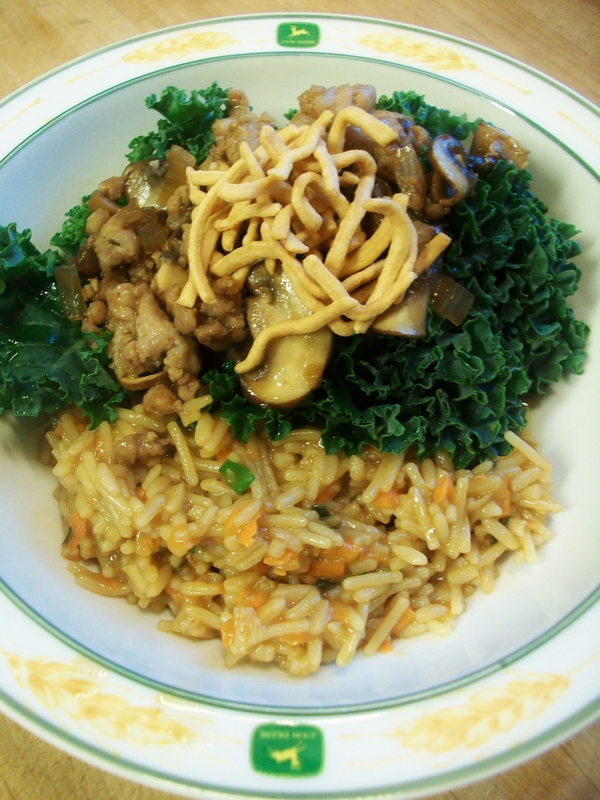 Serve on kale with rice of choice. As I devoured this tasty, spicy bowl of Asian-inspired awesomeness, I remembered that I loathe eating things that are difficult to eat…like lettuce wraps. 🙂 I was actually pleased that this outcome was easy to eat and almost casserole-like (since you know I’m the casserole queen). FYI, I used a store-bought bag of Teriyaki rice, which I doctored up with shredded carrots and green onions. Despite my initial qualms, I think I will save this recipe after all! Posted in PastaTagged Asian, healthy, kale, lettuce wraps, mushrooms, pork, recipe, rice, skillet, spicyBookmark the permalink.